Community Marketers, Join The Revolution! Do you remember when you first considered launching a community? You dreamt of an online utopia that would surround your buyers with vibrant discussions, awesome content and confident peers. Whether you ultimately launched it — or got cold feet — the bleak reality of communities today has shattered that dream: one third of communities have fewer than 100 members and 70% of them are destined to fail, according to industry analysts. Content is outdated. Discussions are uninspired. Members don’t contribute. It’s not for lack of marketing effort, intent or budget, either. Sure, there are some effective forums out there that decrease support costs. But they don’t engage decision makers and thought leaders. They don’t ignite the enthusiasm of happy customers who could turn out to be your biggest brand advocates. They don’t live up to the promise that so many hopeful marketers bought into. No real ties with other community members. No social capital boosting their personal or professional brand. No indication as to which content is the most interesting or important. No pathways to conversations taking place elsewhere on the social web. Compare these communities to the vibrant discussions and debates already taking place in open, independent networks like Quora and Stack Overflow. Their compelling Q&A format drives more high quality member responses. Their democratic upvoting brings the best interactions to the top. Their participants earn points or credits for providing great answers. Their open format encourages participants to bring quality content from across the social web part into their discussions. Much of the content takes them outside the community. Is it a surprise that, no matter how hard well-meaning community managers try, these communities are destined to fail? When you see customers actively engaged on social networks, forums and blogs all over the web, but silent in your community, something must be done. When member posts consistently go unanswered by anyone other than your employees, something must be done. When members receive no motivation, incentives or rewards for their engagement, something must be done. The time has come for a radical redefinition of community. Marketers and community managers, stand up! It’s time to discover your best (and only) means for a radical redefinition of community. The time has come to transform the concept of community into the powerful business asset it was meant to be. But it’s going to take nothing short of a revolution. 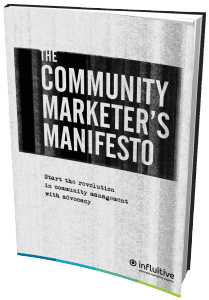 3 Responses to Community Marketers, Join The Revolution!